Aug. 12, 2013 9:00 a.m. Tea and luncheon were served at Barb and Collin Cook's residence. On Saturday, July 20, at precisely 9:00 am, thirty-two bleary-eyed, but excited garden lovers boarded the bus at the Warburg Cultural Centre to escape for a day of dreaming, enchantment, dining, and fun as we viewed six amazing gardens. First on the list is Elaine and Loren Krukowski’s place (Willow Valley Greenhouses). We navigated the long driveway bordered by lawn, flowerbeds and interesting plywood cut outs placed strategically in the woods. Then, the sight of a huge, beautifully manicured country yard greeted us—complete with swing sets, greenhouses, large vegetable garden, many beautiful flowers in baskets, containers and beds. As we entered the back yard, a large new gazebo caught our eye and in it was a table arranged with muffins, tender biscuits hot from the oven, other baking, 6 different homemade jams, fruit, juice and coffee for everyone to enjoy. YUMMY! After being fuelled for the morning, we wandered around the yard and Elaine answered questions about the various plants & trees. Two large cattle troughs in the back were overflowing with strawberry plants and lettuce. Elaine is retired from teaching and busier than ever with grandchildren, greenhouses, cows, chickens and, of course, her love of gardening. Next stop, Ruth Kaiser’s yard. We were anticipating a European flair to Ruth’s yard and we were not disappointed. Ruth and her late husband, Fred, immigrated to Canada from Switzerland and raised five boys. As we stepped off the bus, we could hear a most unusual sound. We followed it and far in the back yard, up the hill was Ruth’s dad playing an alphorn—the same long, wooden horn as seen in the RicolaTM commercials! What a treat that was. Being very humble, he did not want all the attention; however, he did play a couple of tunes for us. Ruth’s farmyard is very large and well kept. She has incorporated simple, everyday items in her flowerbeds including the boys’ sandbox and TonkaTM trucks on display. Almost all the rock in her yard was hand collected and used in a fascinating manner. She has incorporated antique items, old boots, and coloured cooking pots (orange pots next to her orange tiger lilies). Branches, roots and bleached cattle skulls, horns, rope, barbed wire are also integrated into her landscape. And it looked amazing. Her collection of cow bells fascinated us. She is a very gracious kind lady and her yard was enjoyed by all. The Beckers’ (Poplar Creek Falls) large entrance gates welcomed us to the long, paved driveway lined with white lampposts. To the left we were awe struck by the large manmade lake stocked with trout. A cabin beckons all to come in and relax; while the pier invites an energetic, “Whoop!” followed by a cannonball into the lake. At the other end of the lake are two swings—perfect for swinging out over the water and dropping in. On the right, runs Poplar Creek. Rocks had been put into place to make waterfalls. A walking bridge was built over the creek to the other side. Mowed pathways meander throughout the property. The large scale landscape is immaculate with a rolling front yard and a house perched higher up. There seems to be a view from every angle! Elaine and her son were very gracious hosts and again we enjoyed their place very much. Barb and Collin Cook’s delightful property is a genuine five-acre paradise. The enchantment begins as we enter the yard and see the magnificent three-storey Victorian house with shake siding and a deep wrap-around veranda offering spectacular views from every angle. A large manicured yard rambles on forever with seating areas dispersed throughout. The property is surrounded by nature. Barb and Collin saw the potential in this property twenty-five years ago and have since designed and built their home and garage, and expanded the terraces at the edge of the creek that meanders past this amazing property! The quaint guesthouse interior is decorated in all white with hints of blue and vintage linens and furniture throughout. Colourful window boxes overflow with flowers. The view from the window reveals the creek and a lovely white wrought iron table and chair set—like a fairy tale setting, only better because it is real. All the tables and chairs on the property are white wrought iron with stunning pink cushions. Barb goes to garage sales and antique auctions for most of her finds. Recently, reclaimed brick was installed in the huge vegetable garden dividing the garden into four segments with a large flowerpot at the centre—very English style. There is a pagoda towards the back with the signature table and chairs. The lawn continues further on towards two large white chairs and a small table set in just the right location. The entrance to this fabulous design is done with English Country flowers on both sides of the gate, which is an old wrought iron headboard from a bed. Barb, along with help from her sister Carol and some friends, hosted the amazing tea luncheon set up under a white tent. 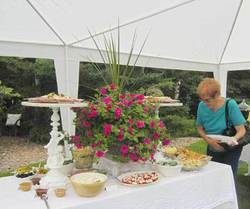 The food was displayed in an English Country style on vintage tables, linens and plates. Barb & Collin have created a rare gem and we so much appreciated being invited in. Rosemarie Zurek’s beautiful Thorsby lot overflows with geraniums, begonias, shrubs and a very large vegetable garden. First thing that struck me was how immaculate it was. She has many red geraniums and the largest begonias I have ever seen in my life! Talk about a green thumb! She definitely has it! Hugging the edge of the driveway are many shrubs including roses and a few very well placed garden ornaments peeking out from under them. The back yard boasts more flowers, an excellent view of the creek, and her abundant vegetable garden. Rosemarie says she gardens for her kids, friends and neighbours. Mmmm…I feel a lot of love coming from this lady. Just inside the gate to the back yard, a small greenhouse, water feature and patio tables and chairs greeted us. Rosemarie kindly provided cookies and refreshments for us. What a sweetheart. As she shared some of her gardening secrets with us, she also shared, with a tear in her eye, that she gives a lot of credit to her late husband, Stan Zurek, who loved gardening. For the past seven years she has continued on with his legacy! How beautiful is that? Thanks for sharing with us, Rosemarie. Dianne Keirstead hosted our final stop in Thorsby at her quaint home with a wrap around veranda. The flowerbeds surrounding her home are filled with perennials, a lot of them vintage. Dianne is very knowledgeable about her plants and graciously answered our many questions. On the left side of her driveway is a wooded area where she has created little fantasy groupings under the natural poplar trees. Each grouping is surrounded by fieldstones. Little pathways and ornaments and figurines of all kinds are incorporated into the designs, including broken platters or whatever strikes her fancy. A child’s delight! As we boarded the bus for home, feeling happy-tired, we all agreed that amazing doesn’t even begin to describe the experience throughout the day. It takes creativity, a lot of hard work, and most of all love to create these works of art called gardens. “Sanctuaries,” “a little piece of paradise,” and “peaceful places” seem more suitable descriptions. Each garden was beautiful and each gardener’s love of gardening showed through in their way and was felt by all of us who were fortunate enough to be invited into their private sanctuaries. For making our day so memorable, thank you to: Deb Geiger for organizing all these amazing places, Reg Maltais for donating the use of his bus and driving it, Elaine Krukowski for providing the delicious breakfast, Barb Cook for setting up the tea luncheon, and Deb and Bernie Geiger and Kollbrook Esso for sponsoring the cost of the lunch. A special thank you, especially, to all those gardeners whose yards we visited. You had the hardest job of all, preparing your yards for a busload of excited green-thumbers!